On July 7, 1941, 27-year-old mother of two Emma Laisure went to the office of Dr. Nathaniel H. Schaffner in Chicago. Her husband, Earl, had made the arrangements and paid Schaffner $40 for an abortion. Emma died at Schaffner's office before he could even complete the abortion. Earl said that Schaffner warned him to "say nothing about it to anyone." Schaffner kept Emma's body for 8 hours, evidently waiting for Earl to come for it, before finally taking it to the family home. To compound the tragedy, Emma died on the couple's seventh wedding anniversary. Schaffner insisted during his trial that though Earl had offered him $40 to perpetrate the abortion, he had refused and Emma had shown up later, in severe pain, and died of a heart condition before he could even finish examining her. The jury didn't believe him. Schaffner was convicted of murder and sentenced to 14 years in prison. He appealed his sentence but it was upheld in 1943. I was originally very skeptical about a story told on the National Organization for Women web site. They said that Vivian Campbell was a recently-separated 24-year-old mother of two when she discovered she was pregnant. NOW indicated that Vivian sent her children to stay with her parents while she obtained some sort of illegal abortion. NOW provided no details of the abortion, but did say that Vivian asked for her estranged husband, who came to the hospital only after she had died of peritonitis on May 6, 1950. I decided to check the story out when I was able to visit the archives of the Allegheny County Coroner's Office in Pittsburgh. What I found left me totally bewildered as to why NOW and other abortion advocacy organizations using Vivian's story didn't bother to do any research.They certainly would have hit pay dirt. The details paint a poignant picure. 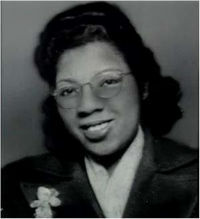 Vivian worked for the IRS, her age was 27, and her death took place at 7:05 p.m. on Friday, July 7, 1950. Her estranged husband, Edward L. Cambpell, told the coroner's jury that on the evening of Thursday, June 22, he got a call at work. He was to go to the Elks Hall to pick up a package from Vivian and deliver it to the children. When Edward arrived, he noticed Vivian sitting at a table, drinking, with two men. Edward ordered a beer, and the bartender gave him the package. Though Vivian did approach the bartender to verify delivery of the package, she didn't speak at all to Edward. On Wednesday, June 28, Edward spoke with Vivian's grandmother, Mrs. Jordon, who told him that Vivian was very sick. He called Vivian's home but the woman who answered, Miss Daniels, said that Vivian was too sick to speak to him. He told Miss Daniels to get a doctor and whatever else Vivian needed. On Friday, June 30, Dr. John C. Reed was called in and cared for Vivian. He returned the next day, July 1, and talked to Vivian about his conclusion that she'd undergone an abortion. She admitted to taking a large amount of castor oil, but said she'd taken it for a cold. Dr. Reed told Vivian that she needed to go to the hospital, and her friends drove her to McKeesport Hospital, where she was admitted at 11:30 a.m, suffering from abdominal pain and distention, and moderate vaginal discharge but no bleeding. Her admission notes indicate that she had already expelled the fetus and most of the placenta, but might have retained some tissue. Her vital signs were alarming, with a pulse of 120 and respiration 26 and shallow. Her blood pressure was 118/70, within normal limits. She had some deep tenderness of the abdomen. She appeared to be slightly dehydrated. Her doctor prescribed medications for her. Edward visited Vivian at the hospital at about 3:30 that afternoon and found her very sick. He consulted with Dr. Reed, who said that Vivian had gangrene and was in very serious condition. He called her from time to time to check in on her. Finally on Friday, July 7, Edward got a call at about 4:30 p.m. from Vivian's family, telling him to hurry to the hospital. He found his estranged wife unconscious, and remained at her side until her death that evening. At no point, Edward said, had Vivian said anything to him about the abortion. According to Vivian's death certificate, she had suffered a ruptured bowel during the abortion attempt, causing the peritonitis that killed her. On July 2, 1982, 23-year-old Darlene Wood was put under anesthesia for a second trimester abortion at Temple University Hospital. The abortionist was Renga Rajan; the anesthesiologist was William Stevenson-Smith. Darlene was given nitrous oxide by face mask. She started coughing after the procedure began. After the abortion was completed, she was admitted to the respiratory intensive care unit, where she was diagnosed with primary pulmonary hypertension. Over the next several days, Darlene experienced increasing respiratory distress. She was given medication to maintain her blood pressure. But on July 7, Darlene went into cardie-respiratory arrest. She was pronounced dead at 2:50 p.m. The administrator of Darlene's estate contended that the lack of appropriate medical and anesthetic clearance was a substantial factor in her death.